I am writing to you today because I know you share our love for Boston Harbor, the harbor islands, the beach and the sea. At Save the Harbor/Save the Bay we've learned from experience just how important it is to connect all Bostonians and the region’s residents to these spectacular urban natural resources, which belong to all of us. That’s why every year we invest more than 80% of the funds we raise in free public events and environmental education programs that “Share the Harbor” with the region’s kids and families. In 2017, our free programs engaged and inspired 30,000 young people to explore Boston Harbor and the harbor islands and encouraged more than one million people to experience and enjoy our region’s public beaches. These programmatic connections are a critical component of our work, but there are other important ways we work to share and connect Boston’s neighborhoods and the region’s residents to Boston Harbor and the waterfront. Earlier this year Mayor Walsh announced that the City of Boston has begun work on the South Bay Harbor Trail, a project we have championed for more than 10 years. When it is completed, this 3.5 mile-long pedestrian friendly bicycle trail will connect residents from Roxbury, the South End, and Chinatown to the Fort Point Channel and the Seaport District, and connect South Boston with the Greenway, the Emerald Necklace and beyond. The South Bay Harbor Trail is an important part of our comprehensive efforts to strengthen the physical connections between the city and the sea, including important new investments in transit and water transportation and continued improvements to the harbor walk. In 2018, with your support, Save the Harbor/Save the Bay will continue to advocate for investments that protect the health of the marine environment and strengthen our city’s waterfront neighborhoods and the region’s beachfront communities from Nahant to Nantasket. 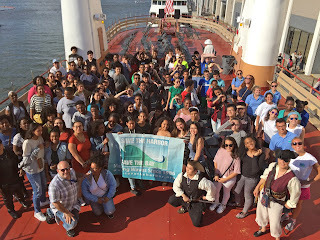 This year we saw a dramatic increase in demand for our free harbor tours and island excursions for underserved kids and families, beginning in the spring with our free Marine Mammal Safaris. On our final fall trip to Georges Island in October we had a waiting list of more than 500 for the Provincetown II, which can carry more than 1,000 passengers. In 2018, we will launch an important new initiative to “Share the Harbor” with underserved kids and their families. With your support, we will host 10 free harbor cruises and island excursions to dramatically improve access to Boston Harbor and the Boston Harbor Islands for those can least afford it. Thanks so much for helping us to transform Boston Harbor from an embarrassment into a source of civic pride and economic, educational and recreational opportunity for all Bostonians and the region’s residents and visitors alike. I know you support the work we do to restore, protect and share Boston Harbor with the more than 1.9 million people who live within a short ride or drive to the sea. I hope you will take a moment to make a contribution today to support our work. You can also join savetheharbor on Facebook, and follow @savetheharbor on Twitter and Instagram. Congratulations to the Winner of the JetBlue "Simply Marble-ous" Treasure Hunt! On October 31st, Save the Harbor/Save the Bay chose The Armitstead Family of Winthrop as this year's winner of the "Simply Marble-ous" Treasure Hunt. Dawne Armitstead found her blue marble with her family during our August trip to Spectacle Island. In addition to marble hunting on the beach, Dawne and the rest of the Armitsteads enjoyed exploring the island, looking for treasure, and hearing a wonderful rendition of Haul Away Joe, the official sea shanty of Save the Harbor, while experiencing unforgettable views of the City of Boston and Boston Harbor. 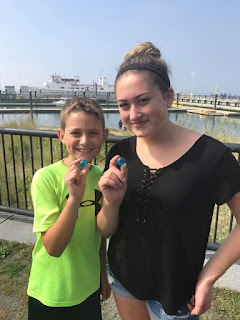 Grace and Aaron Armitstead found their marbles at Spectacle Island while exploring "Treasure Beach." "We love the Simply Marble-ous Treasure Hunt," said Ronda Ivy McLeod, Director of Regional Marketing, Northeast at JetBlue Airways. 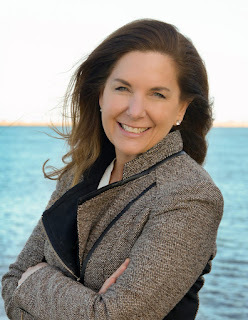 "It's such a unique way for us to get involved with members of the communities around Boston, the beaches, and the Harbor Islands! The ‘Simply Marble-ous’ Treasure Hunt is a favorite among JetBlue’s more than 2,500 crew members in Boston, many of whom volunteer locally for a variety of worthy causes including Save the Harbor/Save the Bay. The treasure hunt exemplifies our fun value, while highlighting our commitment to the city of Boston." The Armitstead Family of Winthrop has been going on free trips and programs with Save the Harbor/Save the Bay for years, and was overjoyed to finally win their first Simply Marble-ous contest. they had no idea they would find the winning marble of the Simply Marble-ous Treasure Hunt! "We absolutely love living so close to the harbor and being able to take advantage of all the beaches and islands, and Save the Harbor provides so many fun opportunities for us to do just that!" said winner Dawne Armitstead. "Our family and friends have created so many memories on the Harbor Islands and look forward to making many, many more. The youth staff is always engaging and fun to be around, and all the staff members-- especially Bruce of Save the Harbor -- are very knowledgeable. We are constantly learning new things about Boston Harbor, and we will enjoy flying over Boston Harbor with our JetBlue tickets!" Congratulations again to Dawne Armitstead and her family! For those of you who found a marble of your own but didn't win, don't worry! Save the Harbor is already planning next year's Simply Marble-ous Treasure Hunt, which begins on Memorial Day. We can't wait to see you out on the Harbor! This summer, the Gulf of Maine Council awarded Save the Harbor/Save the Bay with the Visionary Award for our work in environmental advocacy and innovative scientific research and monitoring programs, and ensuring that the waters of Boston Harbor and Massachusetts Bay and are cleaner and more inviting for people and marine life. Every year, the council awards the Visionary Award to two individuals or organizations in each of its five jurisdictions to recognize their innovation, creativity, and commitment to protecting natural resources within the Gulf of Maine. Save the Harbor is proud of be among the groups and individuals who have been recognized by the Gulf of Maine Council for efforts to protect, enhance, and restore the ecosystem of the Gulf of Maine region and to safeguard and improve the well-being of the communities that depend on its resources. JetBlue, KaBOOM, and a playground was born. On Thursday, October 27th, 2017 jetBlue partnered with KaBOOM to give back to the South Boston community. Their contribution took form of a playground for the Curley Community Center. The expected time to build the playground was 5 to 6 hours or sooner with the help from volunteers. Volunteers ranged from many flown-in jetBlue employees to local community members (like our team from Save the Harbor/Save the Bay), which totaled over 200 volunteers. In order to create the overall playground, parts of the playground were divided into groups. Divided groups consisted of actions such as assembling playground parts, digging mulch and turning cement. Of the assembly team, there were sub groups that put together various playground parts (slide, climbing wall, swing set, etc.). As time passed from 8:30 am to 2:30 pm, cement hardened, scattered playground parts and 2 x 4s were put together, and mountains of mulch disappeared into the playground section. With the help of many volunteers, the Curley Community Center was the proud owner of an outdoor playground that community members of all ages can enjoy. Melissa (left), Trevor (middle) and Lanique (right) removes mulch and relocates it to the playground site.